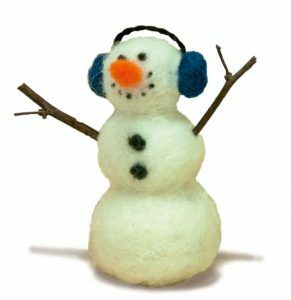 Now that you have perhaps had a go at some of the Needlefelting Projects for Beginners, you might like to try producing some needlefelted ornaments for Christmas. With this type of project, you can enjoy making the items in the run up to Christmas, or perhaps tackle them over the festive holiday when you are really feeling Christmassy but either way, you will end up with some lovely things to go in your box of Christmas decorations to be brought out year after year. It’s all very well making yummy cakes or biscuits but, strange to say, these tend to get eaten and aren’t around for the long term. There’s a great deal of satisfaction to be gained from making your own festive decorations and trimming the tree with personal, rather than commercial ornaments. If you would like to make a bauble for your tree (or anywhere around the house) that’s really easy to do and, in my view, extremely effective, then I recommend you take a look at this tutorial below. To be honest, there’s not a huge amount of needlefelting needed so it’s ideal for anyone starting out in this craft. You will need a polystyrene ball as your base, then some wool roving of whichever colour takes your fancy or fits your decorative theme (we like this Christmas assortment). A good needlefelting tool is also required along with standard items such as scissors, glue and pins. And some sequin trim to add the sparkle! This video takes fewer than 3 minutes to watch so isn’t going to eat into your day. And once you’ve got the basic idea, it would be pretty simple to add extra bling with more sequins, glitter or whatever takes your fancy. This next video runs to just under 5 minutes and shows you how to make simple, needlefelted Christmas trees. These are pretty straightforward to make so are very suitable for the complete novice. Or, being pretty quick to make, you can produce several of these to hang on your tree or even add to a garland or wreath for extra texture. And, of course, you don’t have to use “traditional” Christmas tree colours: you could jazz them up to match your decorative scheme. I hope you take inspiration from these ideas for needlefelting your own Christmas decorations. There’s a lot of scope here, to choose your own colours (so can match a decorative scheme), or to add embellishments at a level anywhere from subtle to extreme bling! And then you can use them on Christmas trees, add to wreaths, garlands or just put on the mantelpiece or the dinner Christmas table. These would also make great gifts with that personal touch: Christmas stocking fillers, presents for colleagues and even ideal for school Christmas fairs. Do share with us here at Crafty Bug pictures of your own creations. We would also love to hear how you have used them in your preparation and decorations for Christmas. We love this cute snowman and think he would make a great addition to your festive scene. He comes in a kit form complete with full instructions. He’d make a fun project to do over the Christmas period or the kit would be a super gift for someone interested in crafting.